Prior to the presidential elections, it was revealed how Egypt's Islamists viewed democratic elections as an obligatory form of "holy war." Then, any number of Islamic clerics, including influential ones, declared that it was mandatory for Muslims to cheat during elections—if so doing would help Islamist candidates win; that the elections were a form of jihad, and those who die are "martyrs" who will attain the highest levels of paradise. Top Islamic institutions and influential clerics, such as Yusuf al-Qaradawi, issued fatwas decreeing that all Muslims were "obligated" to go and vote for those candidates most likely to implement Sharia law, with threats of hellfire for those failing to do so. That many Egyptian Muslims heeded these commands to lie, cheat, steal, and kill in order to empower Sharia, there is no doubt. Story after story appeared in the Egyptian media—much of it missed in the West—demonstrating as much. Those dealing with brutal violence speak for themselves. For example, a Muslim man "beat his pregnant wife to death upon learning that she had not voted for the Muslim Brotherhood candidate Muhammad Morsi." According to police reports, "despite her pleas," the husband "battered and bruised" her after discovering she had voted for the secularist candidate, Ahmed Shafiq. She died later in the hospital "from injuries sustained." Likewise, a farmer was stabbed by a "supporter of Morsi," simply for putting up a picture of the secular Shafiq on his motorcycle. Another 52-year-old man and "supporter of Morsi" slapped his mother for voting for Shafiq. The man took his elderly mother to the voting booth, informing her that she must vote for Morsi; after she voted, he pressed her to confirm that she did in fact vote for the Islamist—only to be told that she did not. The man "lost his temper" and slapped her in front of the other voters and electoral supervisors. Finally, and in accord with the Muslim Brotherhood's own directives, whole segments of Coptic Christians were prevented from voting. According to Al Ahram, Egypt's national newspaper, in Upper Egypt, where millions of Copts live, "the Muslim Brotherhood blockaded entire streets, prevented Copts from voting at gunpoint, and threatened Christian families not to let their children go out and vote." 1) Many analysts would like to rationalize these anecdotes away as byproducts of "third world culture"—not the Islamic religion per se. Yet it is curious to note that all the violence and threats of violence that revolved around Egypt's presidential elections were committed by the supporters of the Muslim Brotherhood candidate, not the supporters of the secular candidate, who instead were at the receiving end of the abuses, including death, violence, humiliation, and injustices in general. This fact speaks for itself. 2) Noteworthy, too, is that most of those abused were either women (including wives and mothers) or "dhimmi" Christian Copts—both segments of society that, according to Sharia, are treated as "second-class citizens," to be kept in subjugation by Muslim males, the only "full" citizens of an Islamic state. 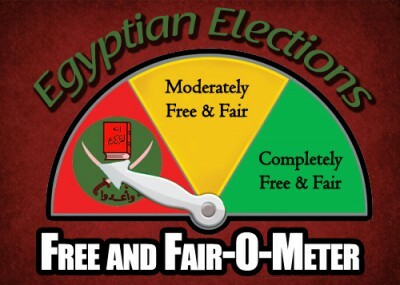 3) Despite all these concrete facts and more, including widespread allegations of electoral fraud at the hands of the Muslim Brotherhood, the Obama administration's only response was to pressure Egypt's ruling junta into declaring a victor—the administration's favorite, Muhammad Morsi—thereby making the United States an accomplice of the Brotherhood's electoral holy war. America is an accomplice of anyone who will support Democratic Presedential Elections.